How do I feel after engaging in regular yoga practice this month? I feel like a changed person. I realize how dramatic that sounds. But it's true. I set out at the start of the month to take three yoga classes a week at the studio where I got an introductory pass for just $40. I stuck with it and attended each and every class. I have just one left on my pass, which brings my total hours of yoga this month to nearly 24 hours. A full day of yoga. I'm almost certain that's more hours of yoga than I've done in the past two or three years combined. What I've noticed after all of this bending and stretching is no surprise. My strength and flexibility are greatly increased. 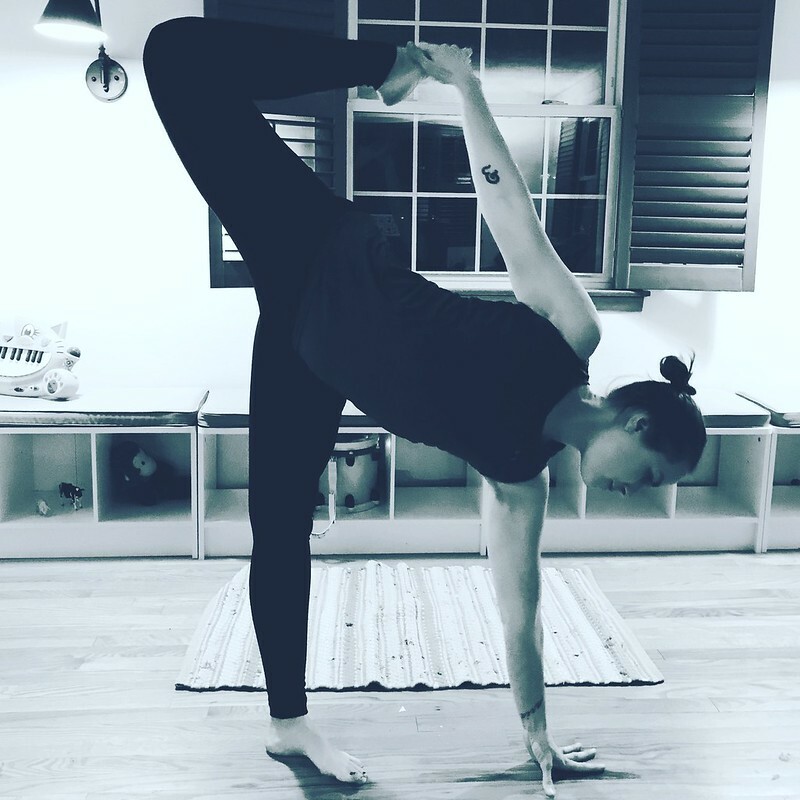 Having practiced yoga since age 18, whether intensely or not-so, as well as having a childhood of gymnastics and dance . . . I will say that I've always been sort of "good" at it. About halfway through the month, it was like a switch flipped and all those years of work had come back. I can do splits again. I can put myself into wheel with ease. And it all feels really, REALLY good. There are also things I just, well, can't do. I used to get so frustrated. But something has changed in my practice. I don't care so much about striking photo-worthy poses just to strike them or to show off. I am all about alignment and doing it the "right" way now. I have much more satisfaction with the journey rather than the destination. Maybe it's being older and having less ego as I approach the mat. The mind-body connection makes more sense now. It's everything. Whatever the case, I cannot afford to keep up at this pace with studio classes. In February, I plan to scale back to two classes a week, which will be approximately $20/week or $80 for the whole month. In March, track season starts, and I'll be lucky if I get to one studio class a week. So, I figure it's worth the investment. I'll be supplementing with home practice to try to keep up with three to four hours of yoga week. My favorite YouTuber is Yoga with Adriene. I also have a 5-year plan of sorts. I hesitate to share because I always have this fear I won't actually do whatever it is I set out to do. I also haven't had a plan in quite a while, so it's both exciting and scary to be thinking this way. I'd like to take a teacher training by age 40 with the hope of deepening my own relationship with yoga and possibly teaching a few classes on the side. Basic trainings in my area can be completed in 10 full weekends for around $3,000. Why age 40? If we have another child, I don't see starting the process for a few more years. Plus, with Stephen's coaching schedule, it's not feasible, but that may change in the future. Yoga + running. That's been my harder balance to strike. I've been running only between 12 and 15 miles a week this whole month. It feels great. But it leaves me feeling conflicted. I think part of it has been the weather. Part of it has been the new focus and feeling guilty to take even more time to exercise (there's only so much time, right?!). I don't know where I am as a runner. It's still this big part of me, but I have absolutely no desire to race or train at high levels. I think when spring comes around, I'd like to be back up at running 20 miles a week, though. Are any of you guys yoga teachers? Or are you thinking of becoming one? I have two favorite instructors. One of them is my age and the other is in her mid-60s. I figure if I obtained my certification by age 40, that's still a whole career ahead of me!